My Vote's For Lemon Square - What's Yours? Winners, Winners, Winners....Are You One? What would you do with $250? Put it towards your Thanksgiving Feast? Donate it to your favorite charity? Put it towards your holiday spending? Splurge on a weekend getaway? In July I did a review and giveaway for Tropical Traditions' coconut oil. It was the first time I've ever tried coconut oil. I was a little apprehensive at first, but was pleasantly pleased with the taste and consistency of it. Tropical Traditions was kind enough to let me try another product of theirs, the Organic Palm Shortening. 1 Gallon Organic Palm Shortening - 112 oz. Palm shortening, derived from palm oil, has some of its unsaturated fats removed, giving it a very firm texture and a high melting point. The melting point of the Organic Palm Shortening is 97 degrees F., making it very shelf stable. It also contains no trans fats and is not hydrogenised. It's great for deep-fat frying, and is not prone to rancidity. Since it has been separated from some of the unsaturated portion of the oil, it is colorless and odorless, and will not affect the taste of foods like Virgin Palm Oil does. The Tropical Traditions Organic Palm Shortening comes from small scale family farms in South America. The Organic Palm Shortening comes in a very large tub. There's quite a bit of palm shortening and it should last the average person a while. My husband has cooked with it a few times now and we still have quite a bit left. The tub has a handle and lid making it easy to lift and store. The palm shortening is white in color and looks a lot like lard would. Once in a while, we like to deep fry foods in my household. Fried chicken, french fries, and tenderloins have been cooked in our fryer using the Organic Palm Shortening. It doesn't have any odor and has no taste, so you can eat your foods with no added flavors. The Organic Palm Shortening is yet another product from Tropical Traditions that we are very satisfied with. You can acquire your own complimentary copy of the Virgin Coconut Oil book with your first online order through Tropical Traditions. One person will win Tropical Traditions Organic Palm Shortening. Leave a comment with a product you'd like to try from Tropical Traditions. Follow my blog via Google Friend Connect. Subscribe to my blog via email. Have my regular blog button on your blog. Have my Heck Of A Holiday Gift Guide button on your blog. Blog about this giveaway or enter it in a giveaway linky, +2 entries. One extra entry per relevant comment for commenting on any NON-GIVEAWAY post. Comments must be made during the duration of this giveaway. Come back here and tell me where you commented. Leave a comment with a coconut recipe you'd like to try. Follow me on Twitter, partymix25. Follow Tropical Traditions on Twitter, troptraditions. Tweet about this giveaway, leave a link to the tweet (can be done once daily). Subscribe to the Tropical Traditions email newsletter. "Like" Tropical Traditions on Facebook. Leave a separate comment for each entry and include your email address in the comments. Giveaway is open to residents of the USA. Giveaway ends 11/15/11 at 8 pm CST. Winner will be randomly drawn and will have 48 hrs. to respond to email notification or a new winner will be drawn. I received product for review from Tropical Traditions. The opinions within this post are of my own and I was not influenced in any way. Please do your own research before purchasing products. Your opinions and results may differ. Little Devil - Part your hair down the middle, diving hair into two sections towards the front. Using Monkey Brains' Twisted Sticky Hair Glue, twist hair up and into a spike. Sculpt the spike into a horn shape and finish with black color hairspray for the ultimate devilish look. Angel - Pulling off the look of an angel isn't just about soft fabrics and a halo - soft and sweet hair is important too. Achieve an angelic look by setting hair in thick tendrils using either hot rollers or a curling iron. Once the curls are set and cooled, use a small amount of Monkey Brains Grease Monkey Hair Pomade and gently run your fingers down the curls to loosen for fullness, give a high shine finish, and smooth fly-aways. Twilight Hottie - Is there a werewolf in you dying to get out this Halloween? Rock Jacob's faux hawk using Monkey Brains Crazy Sticky Hair Gel. Simply slick your hair towards the front, working it up into a faux hawk as you go. Monkey Brains Crazy Sticky Hair Gel will hold that hawk in place no matter how many vampires you battle. If a vampire is more your style, let your inner Edward shine with tousled locks, casual clothes and pale, sparkling skin. Slick a small amount of Monkey Brains Grease Monkey Hair Pomade in your hands and rub vigorously through your hair for the ultimate in undead bed head. Lady Gaga - This style chameleon has so many fab looks this year, it's hard to choose just one this Halloween. Why not try her latest look, the hair beret! Worn with any fashionable outfit, the hair beret is a simple look to master. First, slick your hair back into a tight ponytail using Monkey Brains Super Sticky Hair Gel. Fasten with a hair band and wrap ponytail once around to form a slight twist, then sweep up towards your forehead. Using hairpins, shape ponytail to form a hair beret that swoops slightly across the forehead and right eye. Tuck ends under using hairpins and finish with hairspray. Monkey Brains is a collection of hair care that allows you to express yourself. To be fun, be cool and be yourself! With two Gels, two Glues, a Pomade, a Hair Refresher and a Shampoo and Conditioner you will be able to rock whatever hairstyle you're feelin' at that moment.One day you don't feel like getting in the shower and the next you're searching for the hair gel. But you're confident about how you want to look on any given day. Monkey Brains gives you the tools to look cool and have fun doing it. I've got to say, I'm loving the overall package design of Monkey Brains products. They appeal to children and have a unique look. They're not something I could easily dismiss when I saw them on a store shelf. My kids think the monkeys and bright colors are super cool too. But, as we all know, looks aren't everything. It's the actual product that matters. I recently received the Super Softy Conditioner and the Goop Out Shampoo for review. All the kids were excited to try them in the shower. The yellow packaging of the shampoo and conditioner are shaped like bananas and feature a monkey on them. That definitely appealed to the kids. The Goop Out Shampoo is formulated to remove excess gunk and buildup from hair styling products. Both the shampoo and conditioner have a pleasant smell and lather well. They leave our hair feeling soft and manageable, even after we have had gels and hairspray in our hair all day. Although Monkey Brains hair care products are geared for kids under the age of 14, I have to admit that I tried the products on my own hair as well. After all, mommy wanted to know exactly what she was putting on her kids' hair. I have a little secret to tell, I'm more than double the age of 14 and I'd use Monkey Brains products on my own hair any day. Monkey Brains has me and my kids impressed with their innovative packaging and super cool line of hair products. The Monkey Brains collection is available nationwide at mass-market retailers including Walgreens, Walmart, Krover, Food 4 Less, and Ralph's. 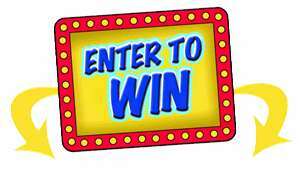 Two winners will each receive Monkey Brains Super Softy Conditioner and Goop Out Shampoo. Leave a comment with a product from Monkey Brains you'd most like to try. Enter my Strawberry Shortcake DVD giveaway. "Like" Monkey Brains Hair on Facebook. Follow Monkey Brains on Twitter, monkeybrains4u. Leave a separate comment for each entry and include your email address in the comments. Giveaway is open to residents of the USA. Giveaway ends 11/15/11 at 8 pm CST. Winners will be randomly drawn and will have 48 hrs. to respond to email notification or new winner(s) will be drawn. I received products for review from Monkey Brains. The opinions within this post are of my own and I was not influenced in any way. Please do your own research before purchasing products. Your opinions and results may differ. You can enter the Tiny Prints Talent Search Contest via Facebook or on their website. I received no compensation for this post. This post is for informational purposes only. Please do your own research before purchasing products or using services. Your opinions and results may differ from mine. Right click on the pages to print and use. I received no compensation for this post. This post is for informational purposes only. Please do your own research before purchasing products or using services. Your opinions and results may differ. It may not be a life-changing decision, but it's a fun one. Your vote for the new flavor in the Extra Dessert Delights lineup will help determine the winner of the Fan Flavorite Vote. Inspired by real desserts, the indulgent flavors of Extra Dessert Delights has a new lineup of possible candidates to go with their already mouth-watering line of Orange Creme Pop, Apple Pie, Key Lime Pie, Strawberry Shortcake, and Mint Chocolate Chip. The three contenders are Bananas Foster, Root Bear Float and Lemon Square flavors. The Lemon Square flavor was inspired by the winning dessert of a Quickfire Challenge in the Bravo series "Top Chef Just Desserts". In case you're wondering, Lemon Square has my vote. Until November 12th, 2011, fans can vote for their favorite Extra Dessert Delights flavor as often as they want on www.facebook.com/extragum and on their mobile phones via m.extragumvote.com. The winner of the Extra Dessert Delights Fan Flavorite Vote will be announced November 16, 2011. Be sure to get your vote in for which 5 calorie gum you want to win. Which will you be voting for - Bananas Foster, Root Beer Float, or Lemon Square? I was entered for a chance to win an Extra Dessert Delights gum prize package in exchange for this post. No monetary exchange took place. Please do your own research before purchasing products or using services. Your opinions and results may differ from mine. 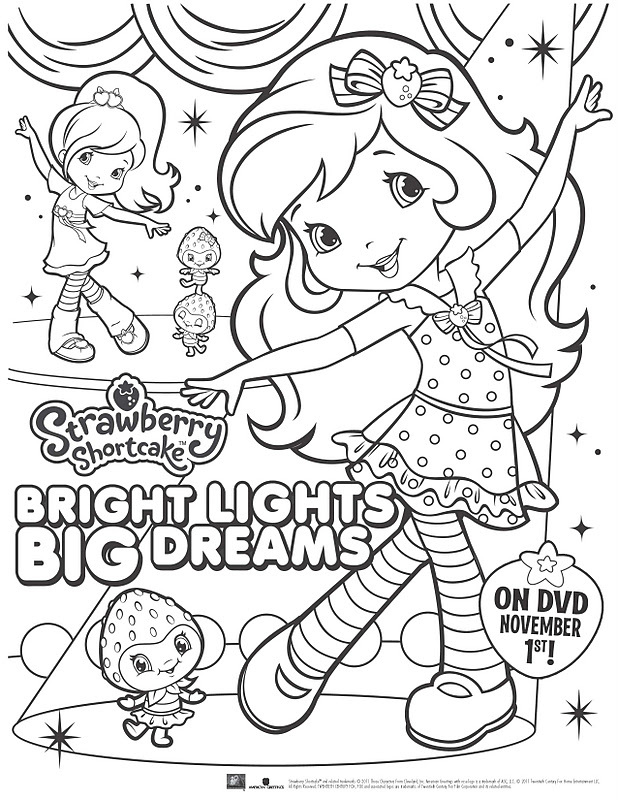 Arriving just in time for the holidays, our deliciously sweet girl next door takes a new turn as Strawberry Shortcake: Bright Lights, Big Dreams comes to DVD November 1st. It's time to dazzle and dream with Strawberry and her friends as they compete for some berry special prizes. Whether it's spinning and twirling in the annual dance-off or beating a world record, there is nothing these girls can't try. But when the road to success seems overwhelming, they soon discover that the real key to being a winner is just having fun with your friends. I remember growing up with Strawberry Shortcake. The updated look of the classic character and her friends brings a modern, fresh face to Strawberry Shortcake without losing the time-honored concept of the classic series. Strawberry Shortcake is appropriate for little girls, showing the true meaning of friendship and how to resolve conflicting situations. 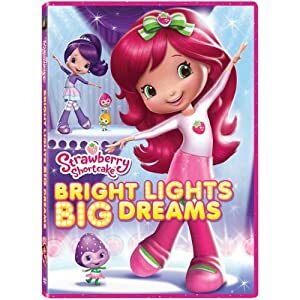 Bright Lights, Big Dreams shows Strawberry and her friends trying their best and working their hardest to win a dance-off, overcoming obstacles, and defining friendships. The DVD, with a running time of 66 minutes, is a viewing delight for young females. 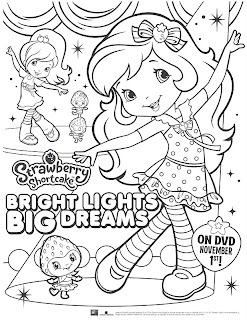 Two people will each win Strawberry Shortcake: Bright Lights, Big Dreams on DVD. Leave a comment with a trait you look for in a friend. Follow Twentieth Century Fox Home Entertainment on Twitter, FoxHomeEnt. I received DVD for review. The opinions within this post are of my own and I was not influenced in any way. Please do your own research before purchasing products. Your opinions and results may differ. I've made my fair share of photo books as gifts for others. Some I made myself by hand with scrapbooks and stickers. Others I ordered from online sites that sell them. I think photo books are a special way to preserve memories and show others you care. A few online sites I've used for photo books have caused much frustration. 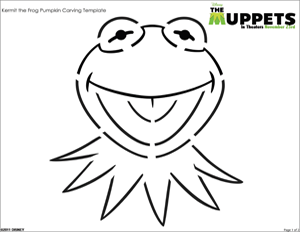 I either can't get the templates to load quickly or the whole process is long and complicated. I recently created a photo book through SmileBooks and was pleased with the development of creating a photo book with my pictures. At SmileBooks you can turn your favorite digital photos into treasured photo books with the seven photo book sizes and multiple cover designs to choose from. You can create your photo book from SmileBooks in one of three ways. With the free software, you can take advantage of their complete range of editing tools and design a beautiful, professional quality photo book in your choice of seven sizes. You can also use their quick and easy online book builder to create a photo book without the need to download software. If you don't have the time or desire for either of those two options, you can try their convenient Design Service - simply upload your photos and they'll do the work for you! I wanted to create a photo book for my teenage daughter who will be moving away and attending college in a few months. I wanted a book that she could look upon and remember the good times and special people in her life. I chose not to download the free software but rather use the Online Photo Book option to create the book in less than an hour. I then selected the book size and cover type. I went with an 11x8 Classic book with a hardbound cover. After choosing the theme and layout, I was able to add my photos. I had the option of placing multiple photos on one page but I preferred to have one photo per page. I chose a polka dot theme but changed some of the pages later in the design process to have a different variety of page colors and designs. 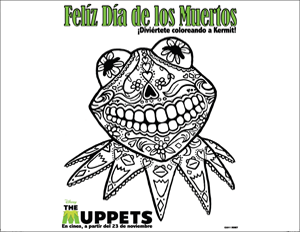 I was able to add clipart as well. The only snafu I had was when I tried to enter text on the pages. It took me a short bit to find out how to place the text where I wanted. Other than that, I was able to create the book in a reasonable amount of time. Once I ordered my book, I received an email confirmation. I also received emails of when the book was finished and when it was shipped. If I choose to do so, I can reorder any photo books that I've ordered within the last six weeks. Once the book arrived, I presented it to Shelby. It brought tears to her eyes. She and I both think the photo book is professionally made and the pictures are clear, quality images. The different backgrounds and clipart on the book go with the personality and scenes of the pictures. Shelby said she'll take the book with her to college and will look through it often to remember the special people and days in her life. In addition to photo books, SmileBooks offers greeting cards and calendars. SmileBooks is offering a free photo book to new customers, minus shipping and handling fees. You will receive a coupon via email to redeem immediately for a free 8"x8" 26-page soft cover mini SmileBooks photo book. One person will win a 11x8 Classic photo book from SmileBooks. Leave a comment with what occasion you'd like to make a photo book for (graduation, Christmas, birthday, other). Enter my Water for Elephants DVD giveaway. Leave a comment with something you learned from the SmileBooks FAQ Section. Follow SmileBooks on Twitter, SmileBooks. Tweet about the giveaway, leave a link to the tweet (can be done once daily). Leave a separate comment for each entry and include your email address in the comments. Giveaway is open to residents of the USA. Giveaway ends 11/11/11 at 8 pm CST. Winner will be randomly drawn and will have 48 hrs. to respond to email notification or a new winner will be drawn. I received product for review from SmileBooks. The opinions within this post are of my own and I was not influenced in any way. Please do your own research before purchasing products. Your opinions and results may differ. A couple of years ago my family took the WAT-AAH Challenge and were recently invited to do it again with the smaller 10 oz. bottle sizes. The challenge was to test the assumption that kids are addicted to sugar and think water is boring. I received a box of two of the four varieties of WAT-AAH and happily took on the challenge again. I put the WAT-AAH in the fridge without telling the kids, to see if they would take notice. They do drink water but they, as well as I, are guilty of reaching for a sugary drink. I put the two varieties, Brain and Body, each in a separate shelf on the fridge. I didn't put them up front because I wanted to test how long it would take the kids to find the waters. It didn't take long! My son, Logan, was the first one to take notice of the bottles in the fridge. He immediately grabbed one up and inquired if it was the same WAT-AAH that we've tried before. I replied that it was but just in a smaller bottle. My son Adam's reaction was the best. He drank the entire bottle of WAT-AAH and swore that he was getting smarter by the minute. He just knew that the water was working on his brain and making him into a genius. He wanted to know how soon we could purchase more. The WAT-AAH Brain has kid-friendly electrolytes. 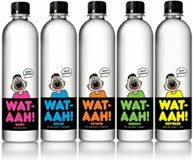 WAT-AAH was created by moms who wanted to convince their kids to drink more water. They came up with an idea to recreate water with personality and a catchy name. WAT-AAH is ultra pure with absolutely no sugar. I can see how it appeals to kids. Heck, it even appeals to me. The packaging and catchy phrases make it seem like kids are drinking something fun, not something they have to have. As for the challenge, the theory was proven in my household when the boys went straight to the WAT-AAH and drank it up. I received products for review from WAT-AAH. The opinions within this post are of my own and I was not influenced in any way. Please do your own research before purchasing products. Your opinions and results may differ. * Create a Keepin' Company Thursday post. Please include the Keepin' Company Button in your post. * Follow the first two blogs, which are the hostesses: Heck of a Bunch and Traci66. * Follow any of the other blogs you choose to and let them know you found them via Keepin' Company Thursday. * If you get a follow via Keepin' Company Thursday please follow them back. * Add your blog name and the URL to your Keepin' Company Post to the link below. There is no need to add your link twice. You can do so either on my blog or at Traci66. It will show up at both regardless. * You can also grab the blog hop code to add to your post if you want the thumbnails to appear in your post. * If you add the Keepin' Company button to your sidebar and leave either of the hosteses, Heck of a Bunch or Traci66, a comment letting us know where to find it we will randomly draw a blog to be in the #3 spot next week. This week's #3 spot goes to Tots and Me. Severe tooth decay is the #1 chronic childhood disease in the United States. America’s Toothfairy strives to eradicate childhood tooth decay by providing non-profit community programs with the comprehensive resources to deliver critical educational, preventive and treatment services. This Halloween, set an example for your children in teaching them to care for other children by joining the "Trick or Treat for America's Tooth Fairy" fundraising drive. Visit: https://americastoothfairy.myetap.org/fundraiser/trickortreat/ to learn about Trick or Treat for America's Tooth Fairy. From this site, you can register for the fundraiser, start or join a team, set a goal, and begin raising money in support of a child-saving, smile-saving cause! You can also donate to the fundraisers or search for other participants and donate toward their goals. I received no compensation for this post. This post is for informational purposes. Please do your own research before purchasing products or using services. Your opinions and results may differ from mine. Four of my giveaways have ended and the winners have been randomly drawn. Winners have been emailed and will have 48 hrs. to respond to email notification or new winner(s) will be drawn. The winner of the Chuggington DVD giveaway is #42, lisa. The winner of the Nature Pavilion giveaway is #3, Bobbie Mackey. i follow heck of a bunch. The winner of the Monte Carlo DVD giveaway is #52, Bee W Bedard. The two winners of the Mistura giveaway are #48, susanlanai and #109, Michele. Congrats to the winners and thanks to all who entered. Be sure to check out my other current giveaways, listed at the top left hand side of my blog. There's no limit to how many you can enter or how many you can win. Devastated by the sudden death of his parents at the height of The Depression, a young dreamer from the wrong side of the tracks, Jacob Jankowski (Robert Pattinson), abandons his veterinary studies at Cornell University. With no other family, no house, and no money, Jacob stows away on a train carrying the circus performers of The Benzini Brothers Most Spectacular Show on Earth. Hired as a veterinarian to care for the troupe's animals, Jacob is temporarily filled with the promise of an exciting life that comes with a traveling circus troupe. However, as he builds a rapport and falls in love with the star of the show, Marlena (Reese Witherspoon), they become prey to the circus's owner, Marlena's violent and abusive husband, August (Christoph Waltz). As the circus begins to crumble from within and against all odds, Jacob and Marlena come together and fall in love through their compassion for a special elephant. With their love on the line, Jacob and Marlena come to a crossroads that will forever change their destiny. Directed by critically-acclaimed filmmaker Francis Lawrence, Water for Elephants will be available on Blu-ray and DVD November 1st. I'll admit the title, Water for Elephants, didn't draw me in and neither did the fact that the story revolves around forbidden love. I am so glad that I watched this movie anyway. It's one of the best films I've seen all year. Water for Elephants embraced me from beginning to end. The story revolves around Jacob, who joins the circus and becomes their vet. He falls in love with Marlena, who is married to a cruel ringmaster and circus owner, August. The three characters involved in the love triangle play their roles very well. The supporting cast is just as delighting to watch. There's also Rosie, an elephant who becomes the show's main attraction, that you can't help but love. With scenes set from the Depression era, Water for Elephants is rated PG-13 for sexual situations and some scenes of violence. There is one scene involving the elephant that made me cringe a little, but it showed just how cruel and egotistical August is. 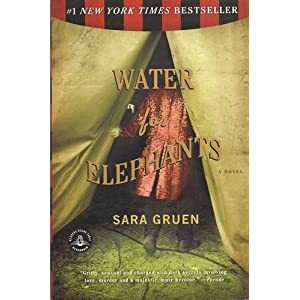 I haven't read the romantic tale based on the same name penned by Sara Gruen so I don't know how the movies compares or how closely related it is to the book. What I do know is that my husband and I both really liked the movie and would definitely watch it again. Now that I have watched the movie, I'm going to purchase and read the book. 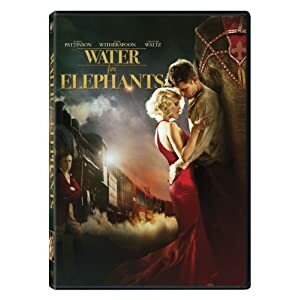 One person will win Water for Elephants on DVD and a book copy of Water for Elephants. Leave a comment with your favorite circus animal or act. 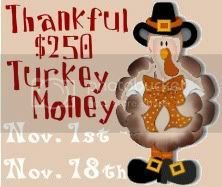 Starting Novemer 1st I am teaming up with The Freebie Junkie and 24 other bloggers to offer you the chance to win cash in the Thankful $250 Turkey Money giveaway. The giveaway will be open to all worldwide and the winner will receive the money in their Paypal account. To enter the Turkey Money Giveaway, simply come back on Tuesday, November 1, after 12:01 am to find the giveaway post. It'll be a "gobblin" good time. Get a 3 year subscription (12 issues each year) of SHAPE Magazine for over 85% off the cover price! Is your household all about fitness and well-being? Then you will definitely not want to miss out on this amazing deal! For the ultra low price of just $12 you will get a 3 years of SHAPE Magazine delivered right to your door. That's 12 full issues each year for 3 years! At over 85% off cover price this deal won't be around for long, so get it before it's gone! Looking for a great gift idea? With the separate shipping address option on the payment page you can even order as a gift. SHAPE Magazine is edited to deliver useful techniques and an understanding of fitness. Top experts from diverse fields of exercise, nutrition, psychology and beauty join forces with nationally known journalists to make each issue a how-to manual for a healthful lifestyle. This post includes an affiliate link. Please do your own research before purchasing products. 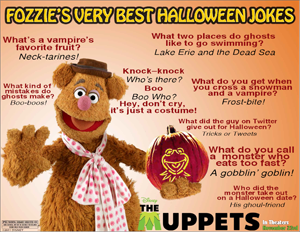 This week Seven Clown Circus and Parenting by Dummies are going with a theme for Wordful Wednesday - Spooky. The theme is pretty fitting, considering it's almost Halloween. I, along with other campers, dressed up in our scariest getups the last two weekends to work in the haunted forest at the campground. We spooked almost 1000 unlucky souls. I was the "Help Me" girl. My son, Adam, played his part. If working together in a haunted forest isn't family bonding, I don't know what is! My 7 year old nephew scared even me. Little Red Riding Hood and the Big Bad Wolf, gone way wrong. My hubby chased people through the forest with a bloody knife. If my scary clown hubby wasn't enough to scare you, there were plenty more to do the trick. Ahhh, how I love Halloween! Having a dog is almost like having a kid. Our dog, Cisco, is almost as spoiled as my children. We've only had him for a few months but he's become a special member of the family. He is regularly rewarded with toys and treats. GlamourDog knows that dogs are special and offers the best in pet fashions and specialty pet items for your furbaby. GlamourDog is a doggie boutique that is dedicated to spoiling your pampered pups. They were kind enough to send me a soft toy for Cisco. I was sent the orange tiger Plush Wild Bone Dog Toy. Measuring seven inches long with an animal print, this dog toy includes a sqeaker inside. As soon as I took it out of the package and pressed the squeaker, Cisco's ears perked up. He immediately came over and took possession of the toy. I swear, you would've thought Cisco found a new best friend. He's carried the dog toy around, chewed on it, played fetch with it, and even slept with it. The plush bone is very bright in color and lasted quite a few days before he finally ripped part of it open and got some of the stuffing out. That hasn't stopped him from still playing with it though. There are a few things on the GlamourDog site for big dogs like mine, but they mostly cater to tiny dogs with their selection of dog collars, clothes, gifts, jewelry, and furniture. One person will win a $25 GlamourDog gift certificate. Leave a comment with a product you'd like to have from GlamourDog. Leave a comment with another product you'd like to have from GlamourDog. Enter my Essentials Foot Lotion giveaway. Sign up for the GlamourDog mailing list. Follow GlamourDog on Twitter, GlamourDog. Leave a separate comment for each entry and include your email address in the comments. Giveaway is open WORLDWIDE. Giveaway ends 11/8/11 at 8 pm CST. Winner will be randomly drawn and will have 48 hrs. to respond to email notification or a new winner will be drawn. I received product for review from GlamourDog. The opinions within this post are of my own and I was not influenced in any way. Please do your own research before purchasing products. Your opinions and results may differ. In September I did a couple of reviews for Stanley Home Products, a direct-selling company that offers high quality household cleaners and more. The Glass Cleaner and DeGreaser Concentrate have been useful cleaning solutions in my home, and I was happy to recently review something from their personal care line. My feet are the most sensitive part of my body. They either react real well to certain lotions and moisturizers, or they break out and itch. The Essentials Feet TreatMint Foot Lotion from Stanley Home Products has luckily been one of the few lotions to provide my feet some relief without causing a skin reaction. The packaging isn't real fancy but the lotion delivers. With peppermint, menthol, and camphor oils, Essentials Foot Lotion is an invigorating foot therapy that moisturizes and works deep to help your feet unwind. With a collagen-rich formula, this foot lotion helps your feet stay young and pliable. I've been applying this foot lotion right before I go to bed and can immediately feel a nice cooling sensation from the menthol. The non-greasy lotion helps relax me and I like how my feet feel softer. If you are interested in earning some extra income, you can take advantage of Stanley Home's business opportunities to earn 35% on every item you sell. One person will win Essentials Feet TreatMint Foot Lotion. Leave a comment with a product you'd like to try from Stanley Home Products. Enter my Devo Olive Oil giveaway. "Like" Stanley Home Products on Facebook. Follow Stanley Home Products on Twitter, StanleyHomeProd. Leave a separate comment for each entry and include your email address in the comments. Giveaway is open to residents of the USA. Giveaway ends 11/8/11 at 8 pm CST. Winner will be randomly drawn and will have 48 hrs. to respond to email notification or a new winner will be drawn. I received product for review from Stanley Home Products. The opinions within this post are of my own and I was not influenced in any way. Please do your own research before purchasing products. Your opinions and results may differ.